When it comes to stock buybacks - an increasingly politically charged topic - 2018 has already been a historic year: as we reported last weekend the $171 billion in YTD stock buyback announcements is the most ever for this early in the year. 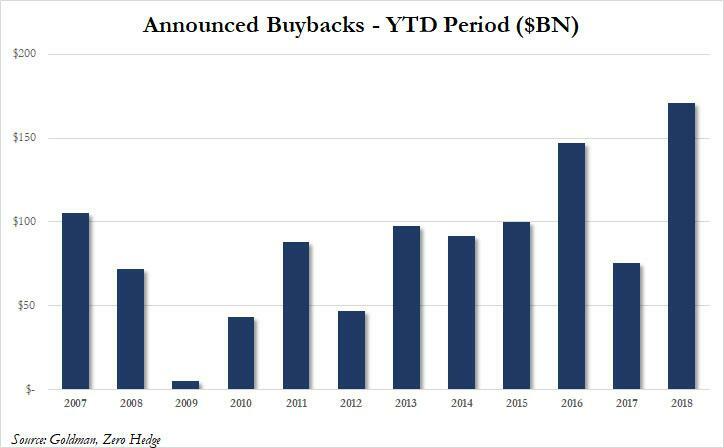 In fact, it is already more than double the prior 10 year average of $77 billion in YTD buyback announcements. 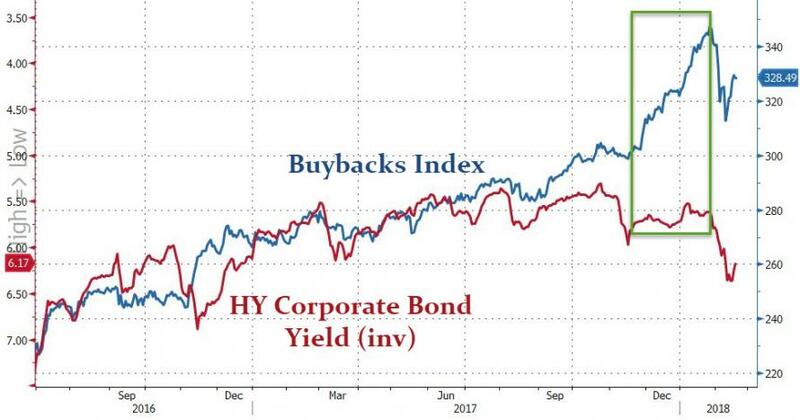 And, according to Goldman's revised forecast of corporate cash use, the buyback tsunami is about to be truly unleashed this year. In a note released on Friday, Goldman's chief equity strategist David Kostin revises his prior forecast for S&P 500 corporate cash spending, and now expects that in 2018 corporate cash outlays will grow by 15% to $2.5 trillion as a result of corporate tax reform and strong EPS growth, with $1.4 trillion (54% of the total) going toward growth while $1.2 trillion (46%) gets returned to shareholders. 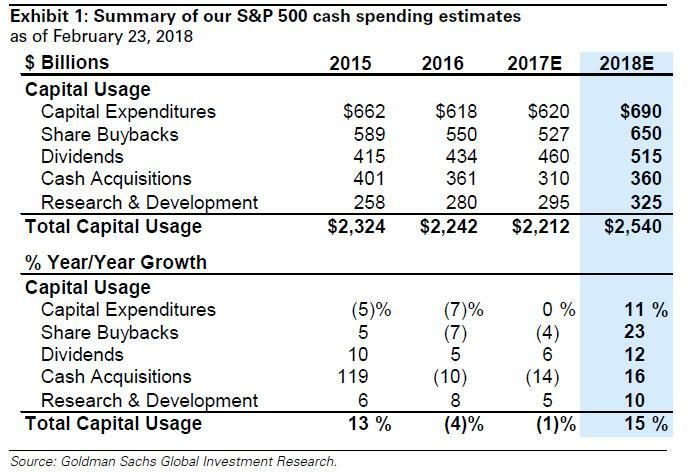 While Goldman expects capex to grow by a modest 11% to $690BN, remaining the single largest use of cash, it will be so only by a fraction as buybacks will be breathing down CapEx' neck, and are set to increase by a whopping 23% from $527BN in 2017 to an all time high of $650BN, an amount which would make total 2018 buybacks the highest annual S&P500 stock repurchase on record. Here a quick reminder: corporations - via share buybacks - have been the main buyers of shares in the U.S. since 2009. 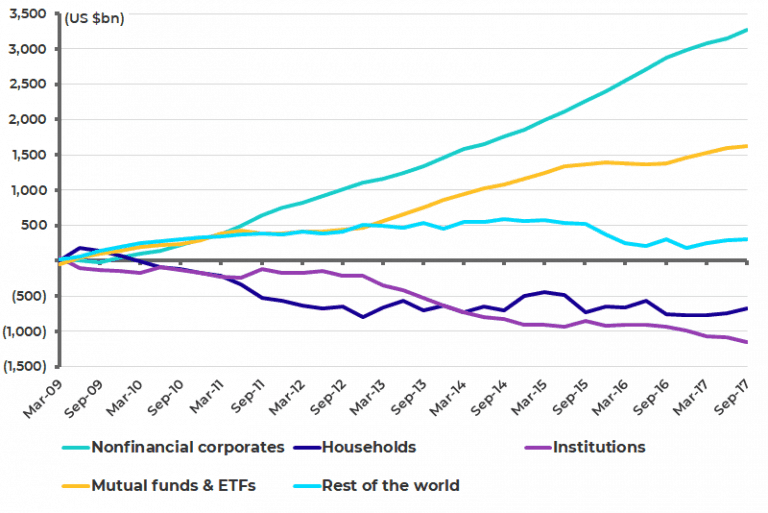 Non-financial corporates have repurchased a net US$3.3 trillion worth of US equities since 2009, according to the Federal Reserve’s flow of funds data based on calculations from CLSA's Chris Wood (see following chart). By contrast, households and institutions (insurers and pension funds) have sold a net US$672 billion and US$1.2 trillion respectively over the same period, while mutual funds and ETFs have bought a net US$1.6 trillion. This tremendous demand for equities from largely price-indescriminate corporations has had a knock-on effect of crushing equity volatility: As Christopher Cole, the well-known Artemis hedge fund manager who has been rightly warning that volatility has been artificially and dangerously depressed for a while, warned "Stock buybacks are in effect creating low volatility," adding that "Share buybacks are like a giant synthetic short-volatility position." 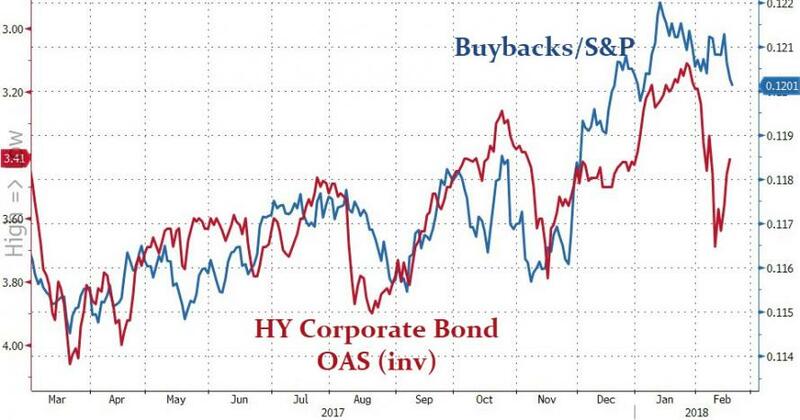 Recently, even Bloomberg hinted at the dangers posed by buybacks, points out that "companies over the past decade or so have significantly increased buybacks to the point where they are now collectively the largest single buyer of stocks. Some have called the market self-cannibalizing. Equity shrink is the nicer way to say that." Vineer Bhansali, the chief investment officer of LongTail Alpha, who has warned about the volatility bubble, echoed Artemis and told Bloomberg recently that buybacks can suppress volatility for the right reasons. When companies produce more cash than they can productively reinvest in their businesses, they buy back stock, lifting prices and curbing volatility. 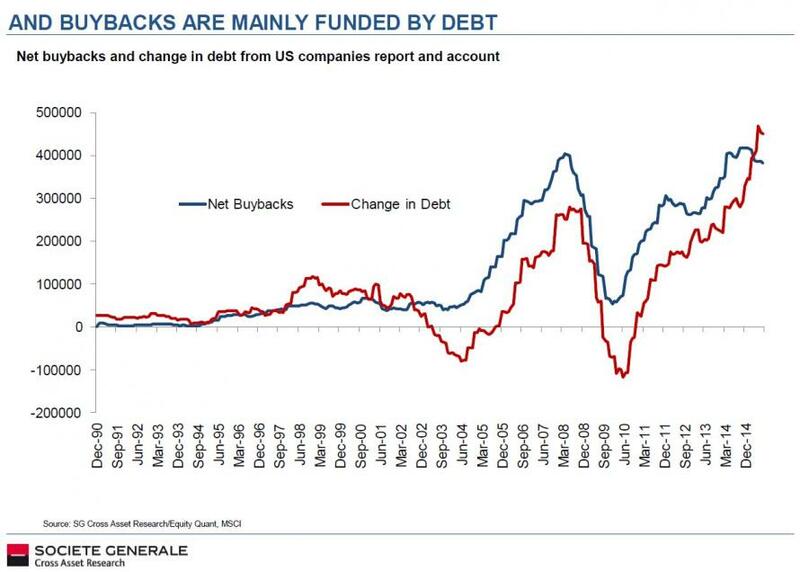 The problem, as has increasingly been the case, comes when companies fund buybacks by taking on debt rather than with the cash generated by their operations, which as the chart above shows, has been almost exclusively the case. That's when repurchases become part of the leveraged low-volatility trade that can unwind disastrously when interest rates rise. This is a problem because according to IMF estimates from last spring, "large U.S. corporations have experienced a negative net equity issuance of $3 trillion since 2009 due to share buybacks.” As a result, total U.S. corporate debt — piled on by both strong and weak hands — sits at an all-time high of $13.7 trillion. Meanwhile, as Kiril Sokoloff's 13-D notes, "the tax bill will disproportionately benefit the strong hands — for one, the richest 10% of companies control 80% of the $1 trillion offshore cash hoard. Begging the pressing question: As the cost of debt goes up, can the buyback spending of the strong offset the turbulence caused by the weak?" That is indeed the question, especially in a rising rate environment because as we showed last week, the total cost of funding debt for buybacks has been rising in recent months. It's not just the rising cost of debt that is a threat to the future of buybacks: there is also a growing political threat which may slow if not halt corporate repurchases. As 13-D wrote in its note last week, "a political backlash against buybacks is intensifying as the tax bill manifests — since passage, total buybacks announced exceed worker bonuses and raises by roughly 63x." Of course, between Goldman's forecast revision, and actual corporate announcements which in recent weeks have included Cisco's announcement of $25 billion in share buybacks, Wells Fargo's $22.6 billion, Pepsi's $15 billion, Alphabet's $8.6 billion and Apple's ongoing stock repurchases which UBS believes will double to $60 billion this year, and Artemis fears seem premature at best. As of 2015, just 30 firms accounted for half the profits of all publicly-listed U.S. companies, down from 109 in 1979. Only through cheap debt accumulation have laggards been able to afford the buybacks necessary to keep stock appreciation stable. As the IMF warned last year, 22% of U.S. corporation are at risk of default if interest rates rise. Ultimately, the biggest factor enabling future buybacks is the recently passed tax reform, whose biggest feature is big cuts in corporate tax, and which is meant to encourage American companies to invest more in the real economy and less on financial engineering. And yet contrary to expectations, companies are set to do the opposite and - if Goldman is right - will boost their buybacks by the most on record, hitting an all time high of $650BN this year. This should hardly come as a surprise: recall that in November, during an event for the Wall Street Journal's CEO Council, an editor at The Wall Street Journal asked the room: "If the tax reform bill goes through, do you plan to increase investment — your company's investment, capital investment?" He asked for a show of hands. Responding to this "unexpected" lack of enthusiasm to invest in growth, Cohn had one question: "Why aren't the other hands up?" The answer: because what companies really were preparing to spend money on was stock buybacks, as recent buybacks announcements have clearly confirmed. 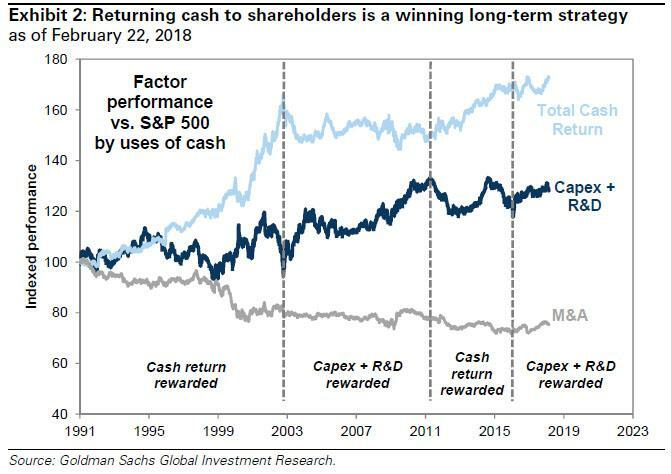 As for why CEOs, CFOs, and corporate treasurers pick buybacks over investment, the answer is simple: as Goldman notes, "Returning cash to shareholders is a winning long-term strategy," and since corporate executive comp is usually linked to the stock price, the monetary motivation is all too clear. Hence the growing political backlash against buybacks, especially among Democrats. In other words, as long as the stock market keeps rising, largely due to buybacks, companies will likely keep those "buyback at VWAP" orders coming in. As Goldman's Kostin said, "the Goldman Sachs Corporate Trading Desk recently completed the two most active weeks in its history and the desk’s executions have increased by almost 80% YTD vs. 2017. New repurchase program announcements will also support buyback growth. Authorizations have surged by 100% YTD vs. 2017." So can anything spoil the party? Well, yes. First, and foremost, there's rates: as we noted last week, as debt costs spike, it will become harder for C-level execs, no matter how desperate to juice their compensation-dependent stock prices, to justify the balance sheet leverage to buyback shares in a market whose Fed Put appears to have been removed. In addition to the potential threat of higher rates which could put a damper on debt issuance, and thus debt-funded buybacks, there are other, more intangible considerations. As 13-D reminds us, until the early 1980s, buybacks were illegal in the U.S. due to concerns executives would use them to manipulate share prices. Today, politicians on both sides of the aisle are threatening restrictions, if not a reinstatement of the ban. Democrats have already made it clear buybacks will be a primary attack point as they seek to sway public opinion about the tax law and take back the House and Senate in the midterms. If rising interest rates and market volatility don’t curb buybacks, politicians may step in and do the job anyway. 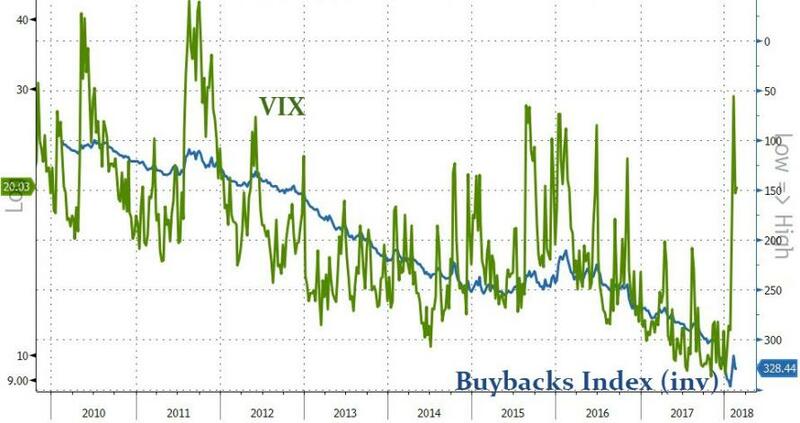 One way or another, as the low-volatility regime winds down, buybacks appear destined for a day of reckoning, as 13-D ominously warns. Buybacks have played far too big a role in the QE era not to cause complications as Quantitative Tightening progresses. In the words of Warren Buffett: “Only when the tide goes out do you discover who’s been swimming naked."